Who knew that some gas stations put a limit on the amount of gasoline you can purchase at the pump? Who knew I’d ever need to purchase $100 worth of gas at one stop? I snapped this picture near Clarkesville, TN yesterday, right after the pump maxed out while filling the moving truck. That is just… Crazy! 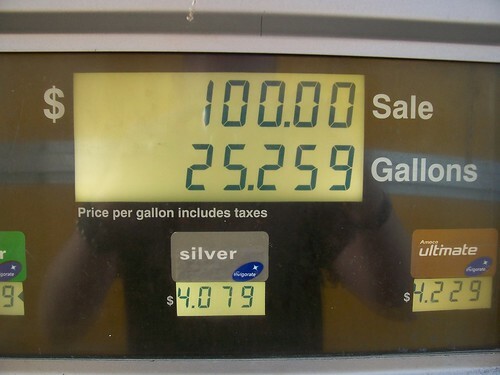 How much space did you have left in your tank? I recently read an article about the ‘conflict’ going on with limits at the gas pump vs. limits on the credit cards. Visa and Mastercard used to have $50 and $75 limits at the gas pump per transaction to help prevent against fraudulent credit card use… Now that prices are getting increasingly higher, their customers were starting to hit problems with spending cap. Looks like they raised it to $100… but it’ll be interesting to see if that’s enough of a raise! That is interesting! Because I’ve never had to buy $100 worth of gas (who has, really, besides truckers and Winnebago drivers–yes, there are still many of those–I’ve seen many on the road), I’ve never had to use my credit card to purchase this much. It wasn’t my Master Card, because today I was able to go over $103! Whoosh! I’ve been there with the limits for a long time with my F250 diesel pickup. But usually I hit it at $75. And then start over again. A lot of gas stations will limit you to this. When going on long road trips, I usually stop at the truck stops and gas up with the big trucks. They don’t have limits for those guys. The thing I found interesting when you get gas at these pumps is that you get an invoice looking thing as a receipt instead of the typical little paper receipt. I guess that’s because most truckers are running a business. Yipes! I’m a bit surprised you aren’t using a moving company but then their prices must be skyrocketing along with the cost of gas. Hope it’s a safe trip. t suit however considerably you might be mindful with all the strategy. the precursor to the Oldsmobile. Car owners mainly buy these parts of car for their very low prices. can do with a few p.c. to pressure the message house a bit, but instead of that, this is magnificent blog. admitted that Mitt Romney didn’t pay taxes for 10 years.